For sensitive, allergic, reactive or irritated skin, this micellar water effectively removes makeup, impurities, pollution and traces of metals with its exclusive formulation. * -10% off (valid on our website) by creating a customer account and an additional -15% off (valid on your first order) by subscribing to our newsletter. The Cleanser P is an exceptionally pure micellar water which gently cleanses, removes makeup, and purifies skin. Efficiently removes impurities, excess oil, traces of pollution and metals (Nickel…) from skin, leaving it refreshed. It is recommended for sensitive, allergic, reactive or irritated skin (acne…). 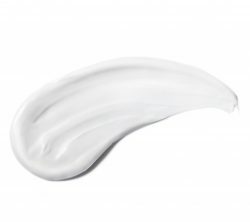 Its formulation is extremely safe and pure, with only 5 ingredients. It contains no paraben, no fragrance, no EDTA, no silicone, no alcohol, no mineral oil, no lanolin. Not completely satisfied? Your purchase today is backed by a 100% 30-day money back guarantee (excluding shipping fees). Get 15% off your first order by subscribing to our newsletter and an additional 10% by creating for free your personnal account. Use in the morning and the evening with a cotton pad. The Cleanser P is: paraben free – metal free (no Nickel, Chromium or Cobalt…) – fragrance free – EDTA-free – BPA free (no phthalates, bisphenol, non-toxic plastic) – sulfates free (no SLS & SLES) – gluten free – silicone free (no dimethicone) – alcohol free – mineral oil free (petroleum free) – lanolin free. 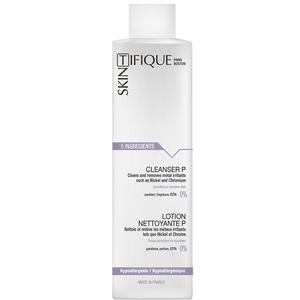 The Cleanser P contains 91.2% natural ingredients. * Only 5 ingredients to reduce the exposure to pollutants and impurities. This cleanser is fantastic. On my sensitive facial skin, it truly is the only cleanser I trust using not only once, but twice a day. Having a severe nickel allergy, I am very hesitate to use anything. I’m so glad Skintifique designed this product for those of use with nickel allergies. It is amazing how this product really cleans up your skin. One swipe with a cotton ball soaked with this cleanser and you can see all the impurities that your normal cleanser leaves behind! When my eczema flares up, this is my go-to for instant relief because it is very soothing for my eczema prone skin and it takes the redness away immediately. Love using this instead of the pump soaps. So much more gentle than most soaps I have tried. Skintifique will use the information you provide on this form to be in touch with you and to provide updates and marketing information. You email address will not be shared with our partners. Why are Skintifique products specially tailored for sensitive skin?